The Faceless one is a figure that I found intriguing in the Mike Young cartoon. I thought, “Hmmm…… Wish I had a figure of that!” Later when I saw the episode where it was revealed that he was Evil-Lynn’s father, this was a lot more depth than I originally gave him. And as I watched re-runs on DVD, Netflix, etc, I began to notice similarities between his castle and Skeletor’s Havoc Staff. The MOTUC version of the figure taps into that. 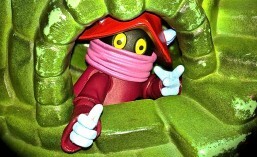 This figure belongs to SpartanSmurf #2….and he’s had it for awhile. So no box. But I assure you that it was the standard MOTUC packaging. The first thing you’ll notice is that he appears to be a little bulkier than the other figures. This is because of his cape…armor…shroud………His clothes. They fit over the figure and just kind of sit on top loosely. The next thing you will probably notice is that he does indeed have a face. Not a very detailed face…But the face is there. The Four Horsemen have discussed this at length. They say they tried a ton of different sculpts, but this is what they liked best. They were trying to capture what was on the cartoon, which was shadows of his features, kind of, only. His face sort of glowed, or maybe radiated on the cartoon. Here it looks sort of like a Roswell Alien. I personally like it myself. But it does have a face. I feel that they could have done other things that would have been cool….made it glow in the dark, or ….. I don’t really know. But what we have here is fine. I won’t take any marks off for it. Back to the armor…or whatever that is. It is a big sculpted piece that serves several purposes. It adds a lot of weight to the figure, though, and becomes a factor when standing him, and posing him. When he is wearing it, he can’t properly raise his arms. You can raise them, but then the armor covers up his face and just looks wrong….So…..
As mentioned, removing the armor piece reveals the standard male buck. It is painted black. He has extensive skirt-pieces hanging down, which are non removable. 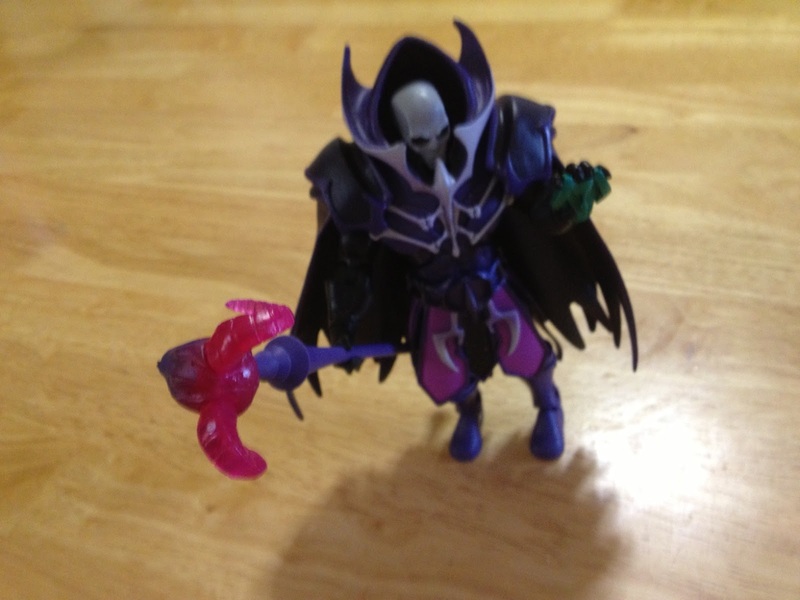 I have seen some people use this body to make a custom movie skeletor! Cool idea. I won’t be doing that, though. 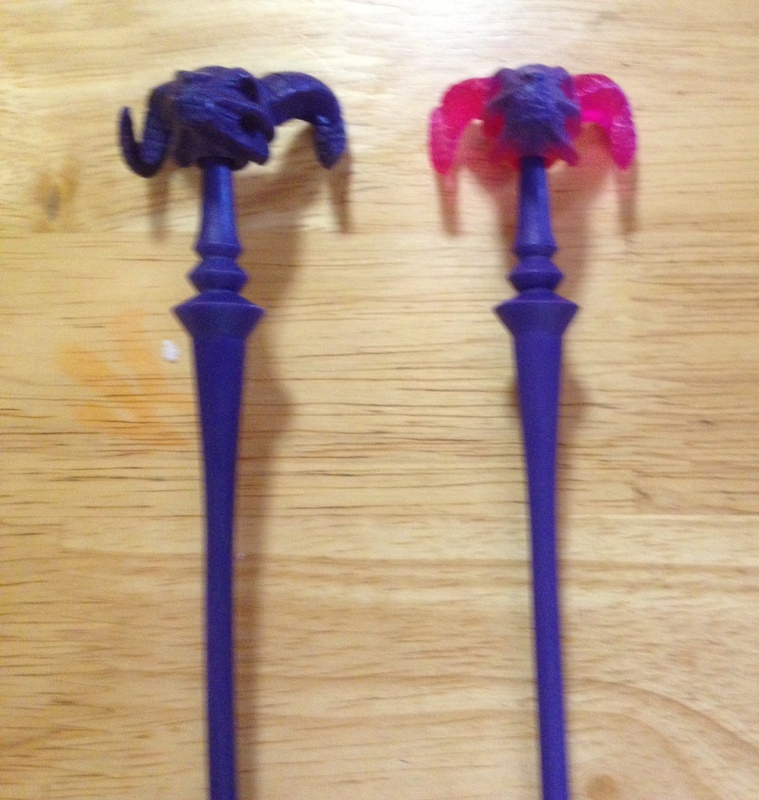 The Faceless One comes with two other accessories….The Ram Stone and the Havoc Staff. The Ram Stone was used in the cartoon to “open any door on Eternia” which of course meant Castle Grayskull. It projected the apparition of a ram, which rammed and rammed at the castle. The toy version is painted shiny green. And it resembles a ram. (duh!) 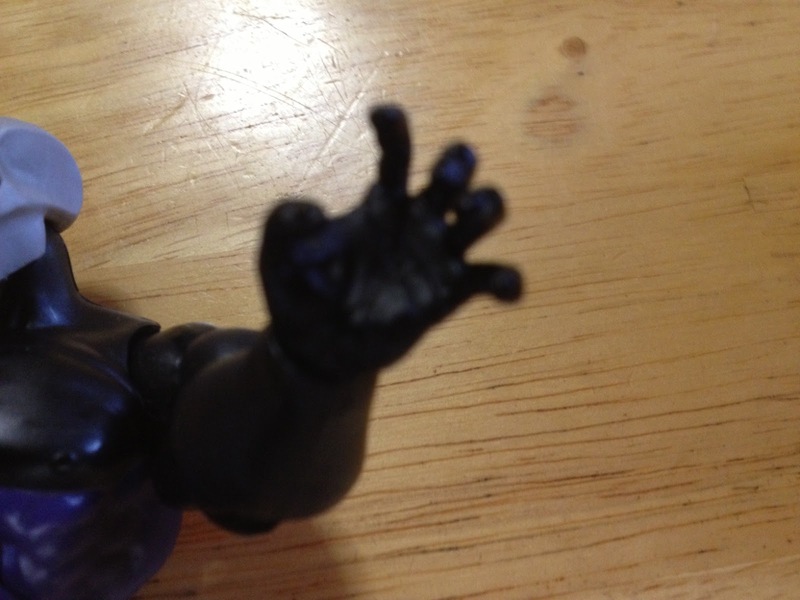 One of The Faceless One’s hands is sculpted to hold the Ram Stone….It is the same sculpt used on Count Marzo’s hand. This means his left hand cannot hold a weapon. But it can appear to be casting a spell, or hold an object like the Ram Stone. The Havoc Staff differs from Skeletor’s only in color. It is a two tone purple and translucent pink. The idea is that it is the staff powered up about to blast someone! Cool accessory! The Faceless One continues to have stiff joints, even after a lot of play. I don’t see any paint chipping or anything like that, even after a good 8 months. So I rate The Faceless One 4/5. He is a good mystical fantasy dude. I am delighted to see him actually as a figure….Who knew one would ever exist? On the other hand, as cool as his clothes are, they restrict his arm movement, and so he loses a point for that. What is your score? Comment on my blog, oh Hub City Geeks! We’re almost at 1000 pageviews. If you comment (within a few days), I have a great prize waiting to send you! 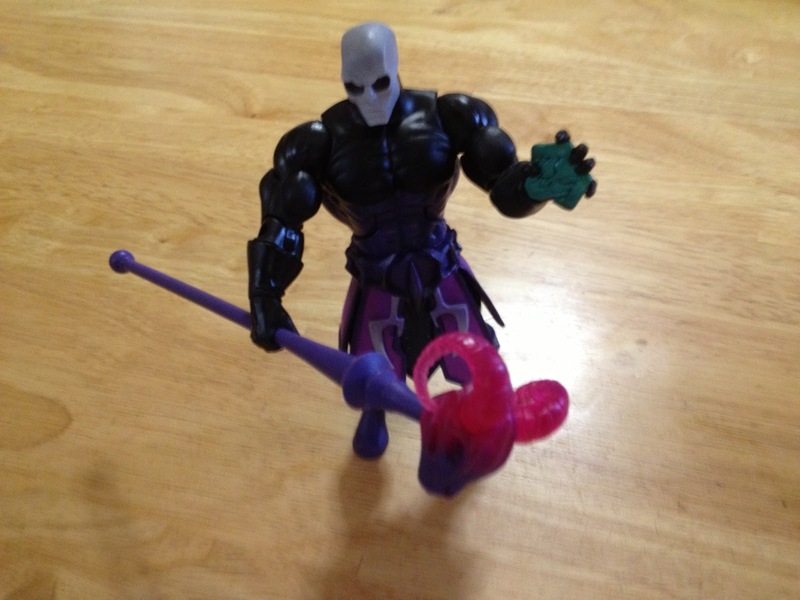 Posted in Castle Grayskull, figure, havoc staff, He-Man, MOTUC, Movie Skeletor, Ram Stone, review, Skeletor, The Faceless One.